I never would have thought that I could be bored watching a movie about a pair of serial killers. Born Killers changed all that, as it is easily the worst serial killer film I've ever seen. Surprisingly enough, this film starts out pretty good and slowly descends into being unwatchable. John & Michael were left to learn about life from their father, a complete psychopath, so it's no surprise, that they turned out to be killers as well. John (Jake Muxworthy) is the quiet, good looking, methodical one, while his brother Michael (Gabriel Mann), is reckless, leaving John to clean up his mess. After we get the back story on the brothers, and see them in action, they go their separate ways, and the story focuses on John. Jake Muxworthy plays the quiet killer, who eventually meets up with a girl. He falls in love and tries to put his killer urges behind him to live the normal life. Muxworthy was the only reason this film got a rating at all. The film lacked the action I was hoping for and just turned into one conversation after another, but Muxworthy was as advertised, as this good looking, methodical killer, who not only plans things down to the last detail, but who also narrates the story. 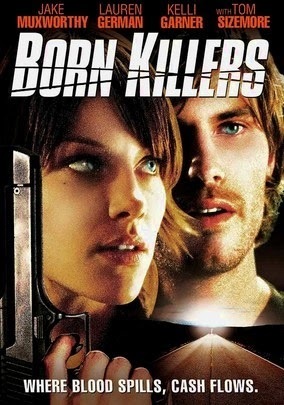 Born Killers wasn't bad in a way where the movie didn't make sense, the problem was how boring and slow moving it was. After the initial action, nothing really happens except for a lot of people doing a lot of talking, and if that's all I wanted to see, I'd just hang out at the mall.